The Third Eye Chakra – also called the Sixth Chakra, and Brow Chakra, and Ajna Chakra – is located between the eyebrows in the center of the brain. The pituitary gland, hypothalamus, and the autonomic nervous system, are governed by the third eye chakra. It is the energy center for our ”sixth sense”, intuitive perception, psychic abilities, and visualization. The third eye chakra is associated the element Light, the sense of Intuition, and the color Indigo. Third eye chakra healing is about having control of how to open and close the third eye. Brow chakra healing will open up your psychic abilities – clairvoyance (seeing), clairaudience (hearing), clairsentience (feeling), and claircognizance (knowing/clear thought). Third eye opening is about being able to receive intuitive information, and about having a greater control over your mind and emotions. When your third eye chakra is awakened and balanced you will experience high mental ability, clear thinking, focus, and good health. You will also be able to combine emotion and logic, and separate imagination from reality. Having your third eye opening can also help with fatigue, sleep problems, day dreaming, disorientation, inability to listen to others, empathy of others, and gaining self confidence. When your sixth chakra Ajna, has been blocked for a longer period, you will begin to experience emotional and/or physical health problems (see symptoms of a blocked brow chakra below). Third eye chakra healing will open, awaken, and balance your sixth chakra Ajna. You will begin to allow the life force to flow freely again with third eye opening healing sessions. Opening the third eye chakra will not only cure the symptoms, it will also heal the root problems! As your sixth chakra is balanced, it will positively affect the other chakras as well since they work as one system. This means that the healing benefits from third eye opening will appear in several areas of your life. So, what problems can these third eye opening techniques assist you with? What are the sings of a blocked brow chakra? 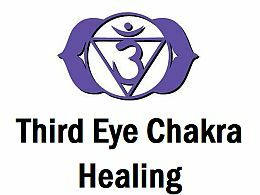 How can Third Eye Chakra Healing be of help? Third Eye Opening benefits? Third chakra healing can help you with headaches, migraines, sleeping problems, fatigue, dizziness, day dreaming, and disorientation. Opening your third eye can also assist in increasing your self confidence. Your listening skills will improve and you will become more empathetic with third eye opening sessions. Improved memory, improved learning ability, and enhanced intuition, are also benefits of awakening the third eye. When you are in the process of opening the third eye chakra you will start experiencing higher states of consciousness and receive guidance from your higher self and Spirits. Signs of an imbalanced brow chakra or Ajna chakra include: headaches, migraines, dizziness, nausea, learning disabilities, panic, depression, seizures, tumors, brain cysts, problems with eyesight, hearing, balance, and the spinal cord. Make sure to seek medical attention if you are having any of these symptoms. Third eye chakra healing is not a medical treatment, but a complimentary healing method. Do you need Third Eye Chakra Healing / Third Eye Opening? You could really benefit from applying some of the third eye opening techniques described below, if you suffer from low self confidence, headaches, migraines, nausea, dizziness, panic attacks, hearing problems, eyesight problems, or depression. Also, if you have learning difficulties, lack common sense, need to improve your listening skills, lack empathy, are judgmental, are over intellectual, or don’t listen to your intuition, you probably need third eye chakra healing, as these problems are related to the sixth chakra Ajna. Do you have a balanced, deficient, or an excessive Third Eye Chakra? If you have a deficient or excessive third eye chakra, it can be a good idea to heal the sixth chakra as the healing process will balance the energy in this center. The following third eye chakra healing techniques & tools will open, awaken, balance and heal the sixth chakra Ajna: affirmations, third eye chakra stones & crystals, essential oils, foods, Ajna yoga, third eye meditation / Ajna chakra meditation, and sound healing. Learn about the different third eye chakra opening and awakening techniques and choose the ones that you feel guided to. Remember that the healing process should never be ”work”. Make the healing process of the sixth chakra fresh and fun. Alternate between the different techniques, and enjoy the healing benefits! Third eye chakra healing affirmations can be helpful in opening, awakening, and balancing the sixth chakra Ajna. You will connect to a higher consciousness as you state these powerful affirmations on a regular basis described below. Work with the ones that resonate with your sixth chakra (brow chakra). Write down the third eye opening & healing affirmations, and place them where you can see them often – on the fridge, on the mirror, on your computer, in your wallet, in your car, in your office, in your locker etc. Make sure to only do your third eye chakra healing affirmations when you feel good, since you affirm with your vibration. Crystal healing is often applied by energy healers for third eye opening and balancing. The color of the third eye chakra (brow chakra) is indigo; the color of spirituality and wisdom. This is why many third eye chakra stones and crystals have the color indigo/purple. Working with essential oils for third eye opening and third eye chakra healing is a lovely way to relax and enjoy the healing benefits at the same time. Your memory, learning ability, intelligence, common sense, and intuition will improve, as your sixth chakra Ajna (third eye chakra / brow chakra) becomes more balanced. There are certain foods that can fuel the third eye chakra (brow chakra). Third eye chakra healing foods are often purple or dark blue in color, and they nourish the brain and mood. Here are examples on what you can eat and drink to awaken your sixth chakra / third eye chakra. Yoga is very effective for third eye opening and awakening. The sixth chakra or Ajna Chakra, is both the perception and command center. It is from here you recall past events or last night’s dream, and it is also from here you imagine, visualize, and create and your future. There are certain Ajna Yoga poses that can help optimizing your brain functions. These Ajna positions will also open your sixth chakra and allow the life force to flow to the other chakras as well. This means that your overall health will start to improve. As the third eye chakra (brow chakra) is awakened and balanced, your intuition and psychic abilities will develop. You will open up to a higher consciousness and wisdom, and connect to your own Divinity. The Child pose, or Balasana, is great for third eye awakening as it stimulates the sixth chakra Ajna. Furthermore, this Ajna Yoga pose calms the brain, and relieves stress, fatigue, back pain and neck pain. It also stretches the hips, thighs and ankles. Standing Half Forward Bend, or Ardha Uttanasana, is a great Ajna Yoga pose as it stimulates and puts pressure on the third eye chakra (brow chakra). Besides awakening the sixth chakra, it will also improve posture and strengthen the back. Furthermore, this Ajna Yoga pose will stretch the front torso and stimulate the belly. The Shoulder Stand, or Sarvangasana, is a fantastic Ajna Yoga pose as it opens the sixth chakra (third eye chakra) and allows the blood to flow directly into the neck and head. This Ajna Yoga pose comes with many health benefits. It stretches the shoulders and neck, tones the buttocks and legs, improves digestion, helps with fatigue and insomnia, stimulates the thyroid and prostate glands, helps relieve the symptoms of menopause. Furthermore, this Ajna Yoga pose can help with infertility, asthma, sinusitis, and mild depression. 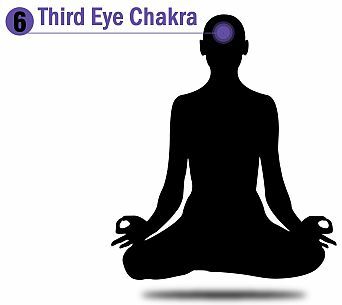 Third eye meditation, or Ajna chakra meditation is very powerful for third eye opening and balancing. You will connect to a higher wisdom and guidance as your sixth chakra Ajna is balanced. As you apply Ajna chakra meditation, try and visualize the color indigo; the color of the third eye chakra (brow chakra). Imagine how an indigo light is vibrating in your sixth chakra Ajna, and how it opens the third eye chakra. Solfeggio frequencies is a sound healing tool that can be very effective in awakening the third eye chakra. The solfeggio frequency for the third eye chakra (brow chakra) is at 741 Hz. This frequency is about connecting to your spirituality and opening up to a higher consciousness and guidance. Listen to this third eye chakra healing frequency (see videos below) on a regular basis to open and balance your sixth chakra Ajna. It’s best to use headphones for optimal healing benefits. Enjoy!